Pencils sharpened, pens lined up, fingers nimble? The Third Annual LHA Write Fifteen Minutes a Day challenge starts on Sunday, August 1st! WFMAD is a bit like NaNoWriMo, but better. Because writing the draft of a novel in one month (which is the goal of NaNoWriMo) is a great challenge, but overwhelming for a lot of people. My approach is smaller and often, more effective. It simply requires that you write for fifteen minutes every day during the month of August. Can you do that? Of course you can. Do you want to? That’s sort of up to you, isn’t it? In a way, this blog can become your writer’s group for the next month. If you already have a writer’s group, no worry. You are not being unfaithful to them, you are expanding your circle. My writer’s group met on Tuesday. We were missing Bruce Coville. I think he was off gallivanting with unicorns. 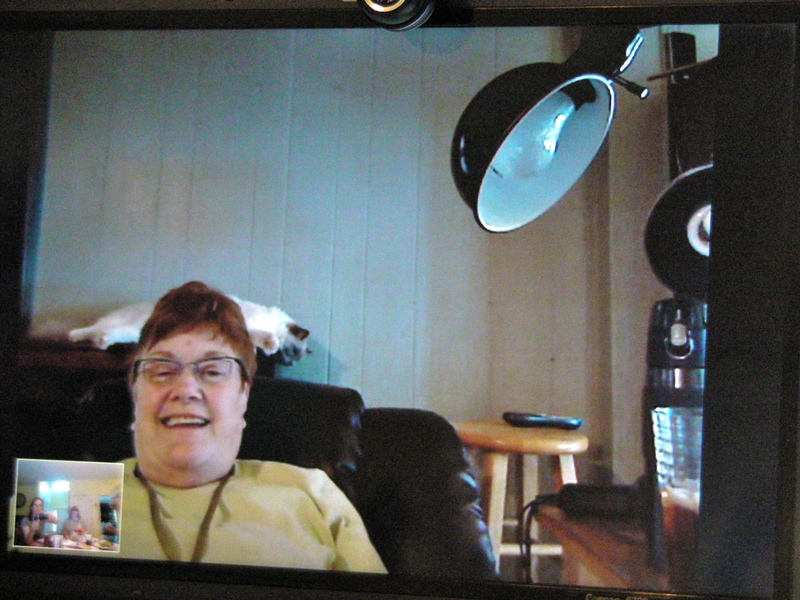 One of our members, MJ Auch, was recovering from surgery, so she beamed into the meeting on Skype. 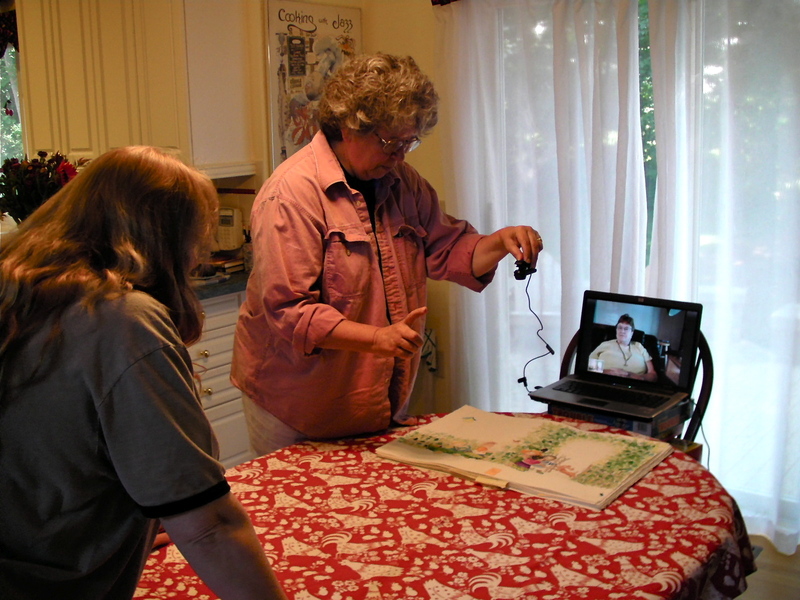 Suzanne Bloom is pointing the camera down at her latest amazing artwork so that MJ can see it. Standing with her back to the camera is author, cook, and amazing writer’s group hostess, Ellen Yeomans. 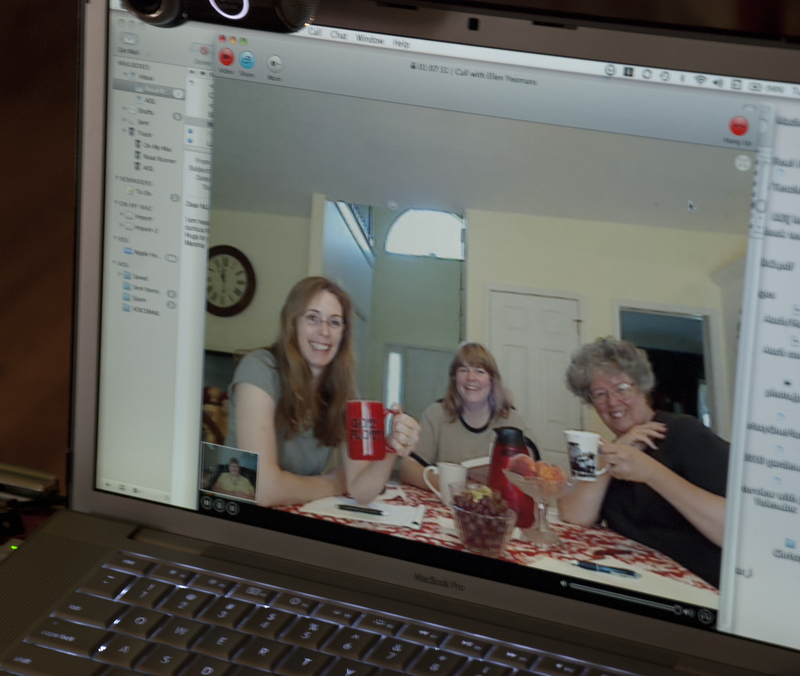 And this is what we looked like on MJ’s computer!! Distance and circumstance need not stop anyone who has the writing dream in their heart. I’ll be reworking the rules for this year’s WFMAD challenge a bit – details on Sunday. But the general guidelines are the same that they’ve been for the last two years. New this year will be prizes – tee-shirts and maybe an ARC of FORGE (or two) for the people who write the funniest or most moving comment each week. One more thing…. I have shifted blog hosting sites. The Mad Woman in the Forest blog is now found at WordPress. The blog will continue to feed to FaceBook, LiveJournal, and a bunch of other sites, but if you want to make comments that I can guarantee you I will read (and will make you eligible for prizes), you need to make them on the WordPress version of the blog. OK, now for real… any questions?? I have a question! Does the writing have to be fiction? Can I start with journal writing and end with fiction? I’m excited!!! You can write whatever makes you happy. As long as you write for at least 15 minutes a day! Yes, you can write on a blog. It doesn’t matter what you write – you just have to do it Every Day. I’m in and excited to participate. I’ve been trying to get myself to write all summer (well, to be honest, for years) but always find an excuse not to. One thing, the general guidelines link is bad. I got an error message when I clicked on it. Love the new site, Laurie! I’m so in for the challange, too!! I am in! Can’t wait! Ooooh, I would love to do this! 15 minutes a day is something I can commit to. Thanks! I am in! I’m really excited!! This will be my first year! ok. going to give this a try. had a really late start on Adk Kids #10 last year. justin is still home this month on college break. this may be fun kick start for #11. PS Awesome fun up in Provo, no? I’m not from there but I am a former BYU Cougar so I made it back. Thank you for a great dinner presentation and the fun informal chats. I’m in. Have deadline, will write! Always enjoy the tips and encouragements, Laurie. Count me in! Thanks for tweeting about this. I’m really excited about doing my 15 minutes per day. I’ve been wanting to participate in one of these ever since I found your blog with the last one you did (missed the boat on that one). YAY! WFMAD — Yessum, this time I am not only ready, but psyched for WFMAD. Given that I’ve written 120 pages in the last 5 weeks, while chairing a conference that was held one week ago, I think I can make the daily 15 minutes and, with a bit of luck, use it as the incentive to finish the rough first draft I’m creating. I am totally doing this! As opposed to the first year, where I started and then didn’t manage it after like three days. Yay! I also love the top of your new blog with the tree! This sounds awesome. I cannot wait to begin. School begins on August 11th and I will be challenging all of my students to write as well. Let the games begin. And, thanks. This is about what I can do with my little munchkins’ awake seemingly every second of the day that my brain actually works. Fifteen minutes… sure! YAY! This is exactly what I need. I’ve heaped some extra helpings on my plate this time around, but I may just have to have my dessert first on some days :-). I just graduated from a MFA program. I gave myself a lovely break for two weeks, but now I need to get back in the game. Count me in. This gentle approach is so smart. I know that once I commit to the fifteen minutes I’ll be writing for much longer. Thank you, Laurie. I’ll give this a shot. I’m heading back for a second Master’s degree and this will be really good release (therapy) time from more heady things. . .the last time I tried working full time and getting a Master’s I ended up with a racing heart. . .I think this will be good therapy if I can keep it up. I’m in! Absolutely! Thanks, Laurie, for posting this. So, does revision count or are we talking only new material? If not, I’m sure I can scare up 15 minutes for new stuff. I’m using this to transition back to a writing routine for the fall. Thanks! I’m in too! I just registered for a novel revision workshop in the Fall, which means I have to finish a presentable draft of my WIP be September 1st. Eeek! The first half is looking good, and the last two chapters, so now I need to finish the rest. August is my busy month as I head back to my teaching job so 15 minutes sounds perfect. I am in and excited. Thanks Laurie. PS.I’m glad you love Utah. I’ve lived in SLC for 30+ years now and love it too. This sounds fun–the perfect thing to get some words down on a regular basis! I’m definitely in, thanks! I’m in for this challenge! It will be great for me! Thanks for the nice push Laurie!!! Actually, I’d committed to do this last week with another writer friend. So now we’re part of something bigger! How fun. Thanks. yes, i’m definitely doing this. i’ve been making excuses for too long, now is the time to do. Count me in to WFMAD. I love this idea. It will help me to continue you developing my writing practice. I need to get some discipline in my writing practice. I’m in. I am IN! This sounds really great. Sounds great! Let’s get to it! Pingback: The Sunday Salon – Writing Challenge with LHA – August 2010 | Everyone Read It!! Next PostNext Ready to Write?